October, we champion community fundraising and encourage you to organise and run events or houndraisers to help our cause. The choice of houndraiser is yours, whether it’s a classic sausage sizzle, a bring your dog to work day, or throwing a crazyhowl-o-ween party for all your friends and their pups, we’re here to help support you and make your event a success! Register for a run, cycle or swim event and ask for sponsors. Host a howl-o-ween party/disco for your friends and their pooches. Sweet talk your boss into having a bring your dog to work day for all your colleagues. Everyone loves a sausage sizzle and a bake sale, host one at your local club or dog-park. Download a copy of our paw-by-paw Guide to Houndraising here! 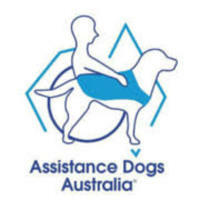 Assistance Dogs Australia train and place remarkable dogs with Australians in need. Our dogs provide improved health, independence and relationships to individuals and families. To train each puppy to the standard required takes two years and costs in excess of $35,000. This investment allows us to transform 8-week old puppies into life-changing Assistance Dogs and enables a decade of 24/7 support for the person on our waiting list. All funds raised will help us train and place another Super Pup, and change someone's life.